Share the post "Defining “Overbore” Cartridges via Comparative Index"
John Barsness published the same information in Rifle 216, April 2002, pp26-33, “Efficient Cartridges”. I guess great minds (or Johns) think alike. Whoops!! That was “Handloader” not “Rifle”…sorry. Interesting. Is there any actual data (not folklore) to support this? Also – why use bore area? The amount of barrel steel to erode or wear out is proportional to bore perimeter (or diameter), not to area. I agree with Josh. Volume/area is a poor proxy for “overboreness”. I haven’t thought it through yet but since a .50 bmg is basically a scaled up ’06 it should equal a 30’06 in “overboreness”. It would serve us better to examine different methods that would reflect this. Editor: There may be better, or more sophisticated formulas we can develop. Looking at the Index Chart, I think John’s approach has merit for initial comparative purposes. It’s not the “final answer”, but it’s a good start in my mind. This means that though the 50 BMG is only 1.406″ longer, i.e. 56% longer, than a 30-06, it actually has VASTLY larger case capacity. The 30-06 has 68.20 grains of capacity, while the 50 BMG has nearly 300 grains! 300 grains is 440% of the 30-06 capacity! That’s why the 50 BMG can and should be considered much more overbore than the 30-06. The 50 BMG may look like a 30-06 clone but the ratio of length to Volume is WAY different. I think the weight of the bullet you are trying to fire also has bearing to if a case is overbore. A .243 firung a 60gr bullet is way overbore, but the same 243 firing a 115HPBT is less so. Over-bore is a term for efficiency, if you are using more powder than actually needed to attain a certain velocity. You can shoot the same 60gr 6mm bullet out of a PPC with the saem speed as with a 243win, but the latter requires a lot more (slower) powder. Editor – I’ve posted on my site a better description of what I meant and a chart of the same cartridges calculated for overbore by my method. WOW! Nice discussion going here. It seems pretty clear that John L. was attempting to define ‘overbore’ as an index of barrel life alone, while Dasher and Ninth Stage would add something like ‘being too large to make effective use of available powders’. So thanks to all of you for a nice exchange. John L. – how about addressing your use of bore cross-sectional area rather than bore surface area? Editor – I’m glad you defended the material you published, but maybe you better read the post on Ninth Stage’s site. Ninth Stage – nice job. 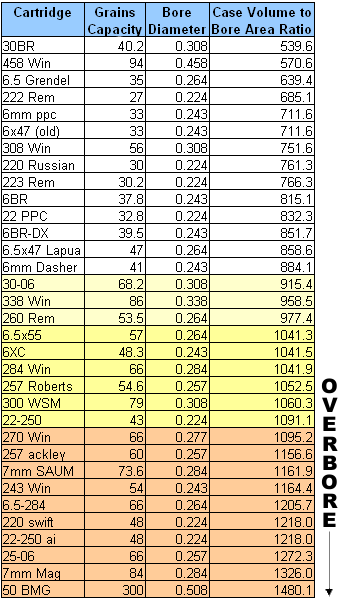 In John L’s table, there is an incorrect value for the 270 Win bore diameter, it is 0.277, not 0.266. This changes the 270 Win index to 1095.2, placing it between the 22-250 and 257 ackley. Also, a volume passing through an area can be equated to velocity if the time for the expansion is considered. A higher gas velocity, i.e., more burnt powder through a smaller bore, results in higher erosion rates. I think John L’s index is meaningful in this regard. Editor: Thanks for noting the error. It has been corrected. The index does use the cross section area of the bore as suggested by Josh. Rex, your comment is correct, all I was trying to come up with is an expression that mathematically compared different cartridges and that attempts to quantify the old “overbore” description. The part I find really interesting is that the cartridges used most in benchrest and other forms where accuracy is the key have the ratio’s much lower than many cartridges. Sometimes it helps to test a theory with extreme cases to see if it still makes sense. Let’s examine John’s with some fictional extreme cartridges. These cartridges all have bore diameter cylindrical interiors 6″ long. Let’s try these cartridges with bores of .308, .600, and 36″ (yeah, that 36″ one makes a .45 ACP pale in the fat and stubby department). The .308 has a water capacity of 112.8 grains (to make it easy to do your own calculations, a cubic inch of water weighs 252o .306 grains). The .600’s capacity is 428.1 grains and the 36″ tub holds a whopping 1,540,875 grains of water. Plugging these numbers into John calculations we get the number 1514 for all three. That’s right, all three cartridges are as “overbore” as the other. John’s equations calculate the grains per square inch. In fact, you can work that number I gave you above, less rounding errors, by dividing 1514 by 6. BTW, by my method, the .308 gets an index of 4915.5, the .600 gets 2523.5, and 42.1 for the 36″ monster. Two issues for me: the barrel throat is being worn out initially by the gas volume/temperature of the powder charge while the effects of friction from the bullet traveling down the barrel is wearing out the tube. Most barrels go “bad” from chamber / throat area erosion not the tube being worn out. However that said the higher the velocity and surface area of the bullet the more the tube is worn so it is a factor. Powder charge vs the bore diameter is important to me as a predictor of potential wear in the first few inches of the barrel. Simply stated less powder or larger bore equals less wear. I am also wondering if case shoulder angles and neck length should be entered into the equation. . . and to what degree they determine where or how severe the powder and flame cut/erode the most agressively in the throat area. There are built in assumptions of this theory, e.g. same pressure, same sectional density of bullet, same bullet bearing surface, etc. This makes the bore cross section and case volume the only contributing factors to “overbore” declaration. It could be interpreted anything with more case volume to bore area than a .22 Short is overbore. The degree of overbore is what is truly being measured, much like the term deep. Salty – true less powder or larger bore for the same charge equals less wear on the throat. Benny – Case shoulder angle and the ratio of the cartridge length (up to the neck) to the case diameter is also a factor in accuracy. Olympian – I most certainly made the assumption of equal pressure. All I was attempting to accomplish was provide a comparative ratio as a numeric value to establish a number for the “overbore” term. The most surprising thing is that most used in target competition under 1000 yards fall into the lower group of the numerical index. FWIW, a 30BR case holds between 40.2 and 40.8 of water. EDITOR: Thanks for the correction. FYI, I changed case capacity to 40.2 grains and ran the formula. This changed the 30BR index value from 510.0 (with 38gr capacity) to 539.6 (with 40.2gr capacity). Notably, that still places the 30BR at the top of the list. This may explain why 30BRs are noted for such long barrel life even though 30BR shooters typically run high pressure loads and fast powders. Has anyone observed where all the benchrest cartridges sit? Well down the line. Interesting. The chart is interesting and ideally you’d be able to graph several different cartridge specifications all on top of each other to see where the lines intersect – assuming you had some accuracy constant on the x axis and all of these other factors (overbore, case capacity, shoulder angle, etc) on the y axis. But therein lies the issue – there is no accuracy specification for any cartridge, let alone several dozen so you’re unable to analytically relate any of these others factors to some standard. The real issue is finite shooting budgets!! An interesting adjunct to this chart would be to publish the exspansion ratios for each case. You’d need to use a barrel length appropriate for each cartridge, of course. I’ve run a few examples and the relationship between the ‘Index’ published here….and actual exspansion ratios….are interesting. That back issue of Handloader is sold out and I cannot find it anywhere. Do you have that article you mentioned? Useful as a comparison guide, though other factors need to be taken into consideration. We should all thank those behind this website for occasionally publishing provoking articles. Unfortunately, this one seems to be mostly opinion, without much science to back it up. Quickload software (reviewed on this site) returns Ballistic Efficiency as a calculated value. The whole ‘overbore’ discussion is a bit hypothetical for the vast majority of shooters. The .264 Mag got a lot of bad press when it was around en mass for being a ‘barrel burner’. Probably is if you shoot it a lot but the average hunter chasing speed goats shoots very few rounds. Overbore: when the increased capacity results in no performance gain regardless of powder type, bullet weight, etc etc. Everything else is an argument over subjective definitions of efficiency. Period. Overbore: when increased capacity yields no additional performance. All else is a discussion regarding relative efficiency. If the volume of the case is being considered, then why not the “volume” of the bore, instead of the “area”? Sure, greater cross-section area between two bores also implies greater volume, but not proportionately so. If you simply look at a 50 BMG case and also the rifle’s bore, it defies observational intuition that it is the “most overbore” cartridge on this list. … Following my previous post, not only does bore volume seem the appropriate factor since that’s how much space the case’s “volume” of powder can expand in, (not internal barrel wall area) but further still, the 50 BMG, tagged here as the most overbore cartridge, is not particularly a high pressure round in this company, nor does it burn out barrels fast, nor have we seen the military utilize a round that is either inefficient (wastes powder) or is relatively hard on barrels, rather the opposite. Common sense tells me that a machine gun bore firing 7mm Mag shells will last nowhere near as long as the Browning BMG.